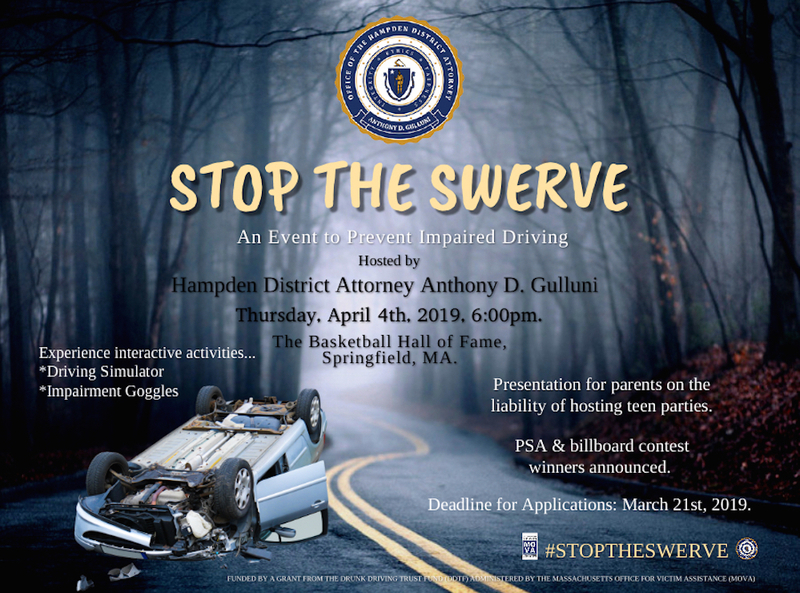 Hampden District Attorney Anthony D. Gulluni is once again challenging area high school students to participate in his Stop the Swerve Public Service Announcement and Billboard Challenge. The PSA and billboard contest is open to all Hampden County high school students, organizations, clubs and athletic teams to highlight the dangers of drunk and/or impaired driving. The contest consist of high school students submitting a 30 – 60 second video entry or billboard design which must be original, note the risks associated with drunk or drugged driving, and communicate messages about public safety. There will be over $15,000 in prizes awarded to winning PSAs and billboard, prizes will come in the form of grants to be used to enhance the winning schools’ technological resources. Winning submissions will also be highlighted at the April 4, 2018 event at the Basketball Hall of Fame. Additionally the winning PSA will be broadcast on-line by 22 News, the CW Springfield, and on-line at WWLP.com. The winning billboard will be displayed on a billboard here in Hampden County.